These homemade flour tortillas are a Spanish food game-changer! They are soft and delicious and can not be any easier to make! In a large bowl, combine flour and salt. Stir in water and olive oil to form a soft dough. Let rest 10 minutes. Divide the dough into 8-12 pieces (depending on the size of tortilla you want) and roll each piece into a circle. Heat a large skillet or griddle over medium-high heat, and cook tortillas, turning when bubbles start to appear. 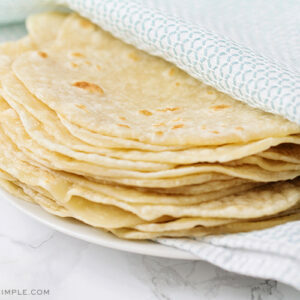 The whole cooking process should take between 2 and 3 minutes per tortilla. Wrap tortillas in a towel to keep warm, and serve immediately.